To commend the historic work of the International Criminal Court under the leadership of its first chief prosecutor, Luis Moreno-Ocampo, Jewish World Watch selected Ocampo as the recipient of the group’s 6th annual I Witness Award. The honor recognizes champions in the field of genocide and atrocities prevention. 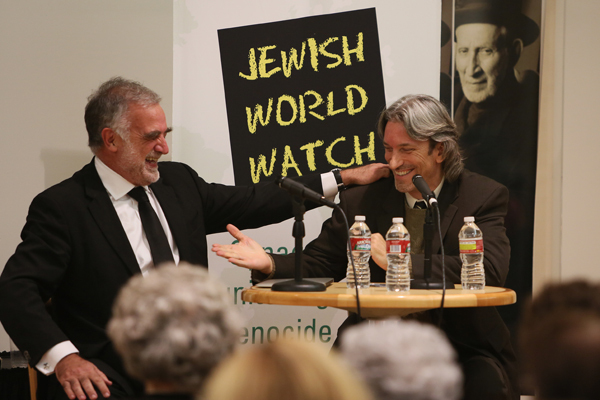 Jewish World Watch hosted a ceremony in Los Angeles on November 14 featuring an address by Ocampo, during which he discussed an earlier chapter of his career as a prosecutor in Argentina and the legacy of the Holocaust in today’s genocide prevention advocacy. In accepting the award, Ocampo commended the activists in the audience, who are drawn to advocacy work by their convictions. Following Ocampo’s remarks, the former chief prosecutor sat down with Enough Project Co-founder John Prendergast for a public interview about the work of the ICC and the specific cases that the court initiated during Ocampo’s tenure. The discussion focuses on what can be done to overcome hurdles many of the cases still face and is punctuated by Ocampo’s candid observations and asides. (“Interestingly, my strong supporter [on the Darfur case] was President Bush, [who] when I started was my worst enemy.”) Through their casual back-and-forth, Ocampo and Prendergast delve into a range of issues at the heart of the atrocities prevention movement, offering an inside glimpse at the workings of the institution charged with responding to the world’s worst crimes.